I am very pleased to see that Save the Children has launched a petition to restart rescue operations in the Mediterranean. I’ve just signed it, and encourage others to do so. I am grateful the organisation is working on this. 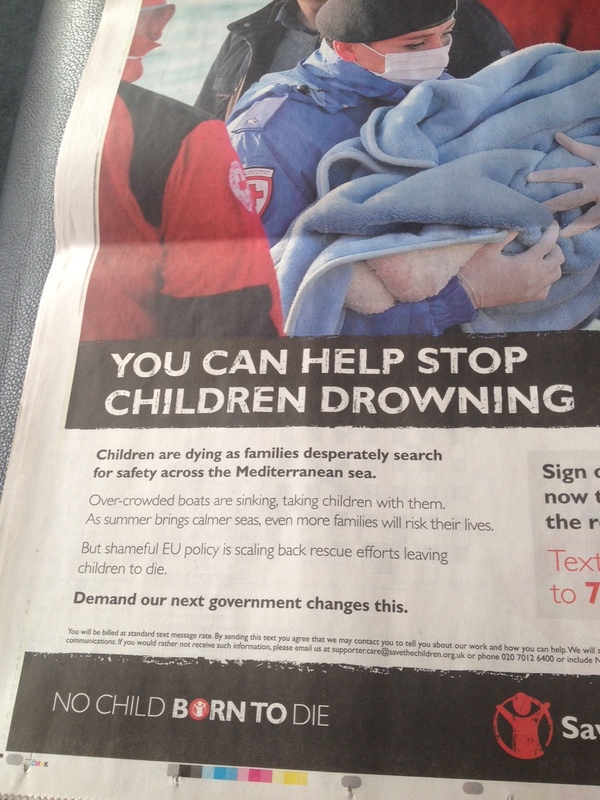 I do however have a problem with the wording of the petition and the newspaper ad – and please, nothing personal against the lovely people that have been working hard on this campaign, as this is a broader issue that goes well beyond Save the Children. I just wish they didn’t use the wording “shameful EU policy”. There isn’t a proper EU policy in place on this. There is currently no legal way for refugees and migrants to come to the EU, which is why they risk their lives on boats. And the reason there is no EU policy, is because governments have so far refused to agree one. It is governments which have stopped rescue operations – including the UK which specifically stated they could provide a “pull factor”. So the petition should read “shameful lack of leadership by EU governments” instead. Why is a seemingly small detail so important? In his excellent new book about Brexit, Denis MacShane says that one of the reasons why Britain is at high risk of leaving the EU is not just because of the anti-EU press coverage, but also because of the silence of pro-Europeans. He is talking about the press in particular. But there is – in my opinion – also another major constituency that needs to change what it is doing: the great and glorious UK civil society and campaign groups. These groups often want joint EU-level action, from development or humanitarian aid to climate change policy, but will very rarely talk about it explicitly. They will happily campaign against something the EU is doing – the TTIP for example – but you will hardly ever hear any of their senior level people say something positive about the EU more generally. Many organisations prefer to steer clear from what is considered a very toxic issue in UK politics (or maybe they simply know the press is not interested in positive EU stories, which goes back to MacShane’s point). When these organisations do touch on EU issues in public facing campaigns, they will often use the sort of unhelpful language that I discussed above. Why is it unhelpful? Trying to push for a new EU policy whilst at the same time using the sort of EU-bashing language that creates anti-European sentiment in the first place may work in the short term, but will backfire in the long term. The Lobbying Act puts a lot of constraints on what charities can say in the run up to the election so I wonder whether blaming “EU policy” may be the easy way to get people’s attention without blaming any political party. Yet this is a long-standing problem. With very few exceptions that I know of – Friends of the Earth’s Mike Childs, Tony Juniper and Ben Jackson of Bond among them – UK civil society leaders are generally very quiet on Europe. And by doing so they are ultimately making it more likely that the UK would vote to leave in a referendum. Leaving the pro European camp in the hands of business lobbies with untenable positions (constantly bashing EU regulations in the press and then balking at the idea people may want to actually leave the block) is not going to work. Those who work on issues that benefit from international cooperation need to speak up. I am not suggesting UK NGOs should start systematically campaigning in favour of the EU but if there is a referendum they may want to do some thinking on the implications of a Brexit for their work. They often have excellent EU policy experts inside the organisations which may be able to help. And at the very least they could start to watch their language, to avoid pandering – perhaps unwittingly – to anti-European sentiments.